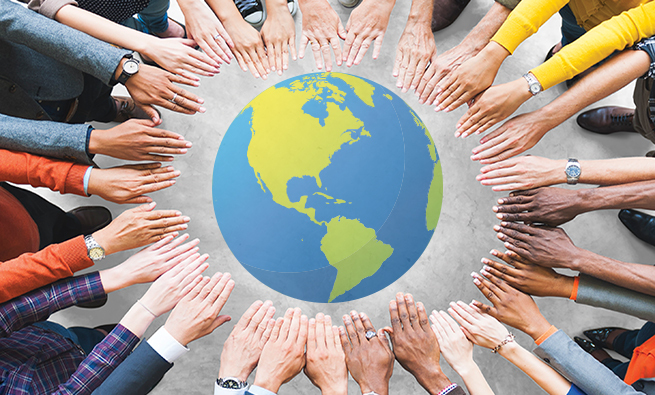 Concerns about sustainability and social impact are increasing and resonating throughout the world and in every type of organization—business, government, philanthropic, and nonprofit. Investors have turned to investments that will lead not only to financial gains but to improvements in the environment and society as well. 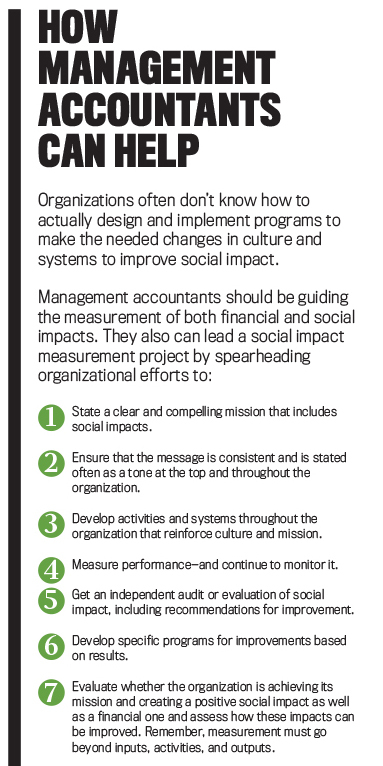 Senior leaders and their financial executives, along with external accounting and consulting firms, recognize the need to measure, monitor, and improve social impact. Yet there are few examples of organizations that have embarked on programs to rigorously measure and monitor their social impact and then publicly report the results with clarity for both accountability and improvement. Mexico’s IPADE Business School, the first business school to publish such a social impact report, provides a model for other business schools and for all organizations concerned with the social impact of their products, services, other activities, or specific programs. Based in Mexico City and with additional campuses in Guadalajara and Monterrey, IPADE is consistently ranked by Financial Times, Forbes, and others as the top business school in Latin America. It has more than 37,000 alumni and has delivered management programs in 24 cities in Mexico and Central America. In 2016, in anticipation of the school’s 50th anniversary, IPADE contacted one of the coauthors of this article, Marc Epstein, to evaluate IPADE’s social impact, empirically test how well its graduates have succeeded in achieving its objectives, and make recommendations as to how IPADE can increase its impact over the next 50 years. Does IPADE develop leaders with the needed critical skills, global vision, social responsibility, and Christian values? Do those graduates then transform organizations and society? Epstein developed an independent and empirically based research project to answer these questions. He conducted the project with an independent research team with support from IPADE faculty and staff but without any interference or monitoring of results so that confidentiality could be provided to participants. The first critical step of the project was to develop a logic model, which is a causal model of hypothesized relationships that should rigorously and clearly articulate the organization’s mission and describe how it’s going to be achieved. This is a typical first step in most projects that measure social impact. Similar to the causal-linkage maps or strategy maps commonly used in for-profit business organizations, logic models are designed as pictures of how an organization does its work. They rely on an “if-then” causal analysis to link outputs, outcomes, and impacts with the inputs and processes that are believed to cause them and to identify the theoretical underlying assumptions. Logic models are important tools for formulating and implementing strategy in a social-purpose organization. They focus the organization on providing more clarity and specificity about what it’s trying to achieve, how it plans to achieve the objectives, and how it will measure success. They show the hypothetical cause-and-effect relationships underlying a program or the organization. Based on logic, empirical evidence, or both, logic models have become a critical foundation of planning and evaluation in social-purpose organizations. Developing logic models is typically a significant challenge for social-purpose organizations (or social-purpose segments of for-profit organizations). This isn’t surprising since the articulation of what an organization is trying to achieve and how it intends to achieve these objectives is also a significant challenge in similar projects in the for-profit sector as companies try to develop strategy maps, causal linkage models, or balanced scorecards. Inputs include both the resources that are available (financial and other resources) and the constraints that an organization faces. Activities are what the organization does with the inputs and the steps to be taken to achieve the desired impact. Outputs are the direct results of the organization’s activities. Outcomes are the intermediate effects on the target population that are necessary to achieve the desired impact goals. They may include the systematic and fundamental progress on meeting social objectives. Impacts are the ultimate goals of a social-purpose organization. The causal relationship between these five elements describes the sequence of activities that are expected to create the changes and desired results. In other words, it describes how the planned work in the inputs and activities is expected to lead to the intended results in the outputs, outcomes, and impacts. Between elements of the logic model are arrows that describe the various paths that lead to increased social impact. An important component of the model, the arrows represent the linkages between each stage in the chain of results. This project focused first on developing this model so it could be tested empirically along with the IPADE mission statement and other critical elements. It was important to test both the model and its individual elements to determine not only the social impact of the institution but also which of the hypothesized elements are most critical for achieving the mission. This became the working model for the evaluation of social impact of IPADE and this project. 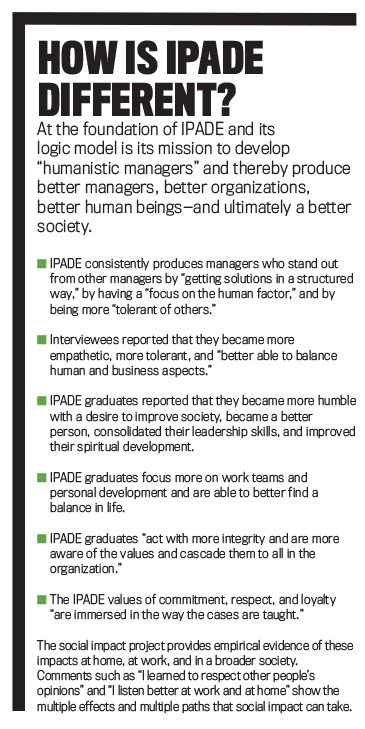 Interviews with non-IPADE graduates about their observations of the behavior, actions, and impact of IPADE graduates. The archival data included internal data such as tabulations, analyses, and reports produced by IPADE for both internal and external distribution. The external archival data included reports from accrediting organizations such as the Association to Advance Collegiate Schools of Business (AACSB), the Association of MBAs (AMBA), the EFMD Quality Improvement System (EQUIS), as well as organizations that collect data from business schools to rank them on various criteria and that share that data broadly, such as Forbes, CNN Expansion, and Financial Times. Though hundreds of pages of reports and archival data were reviewed and evaluated, the data was primarily focused on the inputs and processes described in the logic model. Very little data was included on the outputs, outcomes, and impacts that were the focus of the social impact study. This isn’t surprising since these outputs, outcomes, and impacts are more difficult to measure and, in fact, typically aren’t measured at all. For the data from IPADE graduates, 174 in-depth personal interviews were conducted. All interviews were confidential, with no details shared outside the research team. The interviews were semi-structured, which involved the use of an interview guide but also encouraged participants to express views in their own terms. In that way, semi-structured interviews can provide important, reliable, and comparable qualitative data. Graduates from all three of IPADE’s major campuses (Mexico City, Guadalajara, and Monterrey) were interviewed, including graduates from each of the five decades of IPADE’s programs since its inception and from each of its significant degree and non-degree programs. One focus of the interviews was the ultimate social impact and the individual outputs and outcomes that lead to that impact and create a better society. Another focus was the inputs and activities that facilitate the achievement of those outputs, outcomes, and impacts that are at the core of IPADE’s mission. These are the leading indicators of performance on social impact. The review of the interviews showed amazingly consistent results regardless of the various factors, such as the three different interviewers, graduates from different campuses, different IPADE programs, or graduating classes from the beginning of IPADE to the present. This consistency provides significant confidence in the results. The interviews of non-IPADE individuals were particularly important to the efficacy of this research. It was important to interview senior business leaders, including human resource leaders and recruiting managers, who had no connection with IPADE and were able to observe the behavior and actions of IPADE graduates and compare them with the behavior and actions of individuals who went to other business schools or no business school at all. The results of those interviews provide additional support to the research project. While the IPADE graduates could reflect more on the inputs and activities that impacted their lives, the non-IPADE leaders could reflect on their unique perspectives and comment effectively on business and societal impact. Thus, the non-IPADE interviews provided a counterfactual that was an important part of the research design and implementation—a marker for the social impact created by someone who chose to go to IPADE vs. one who didn’t. In this way, we were able to create evidence about whether the IPADE program is actually responsible for the observed results. The project results show that IPADE provides a differentiated experience from most other business schools in both degree and nondegree programs. Overall, the archival data and the empirical results clearly validate the logic model developed and provide compelling evidence of the impressive success that IPADE has achieved in making a significant positive social impact since its founding in 1967. Figure 1 identifies the level of support that the various elements of the model received during the research. 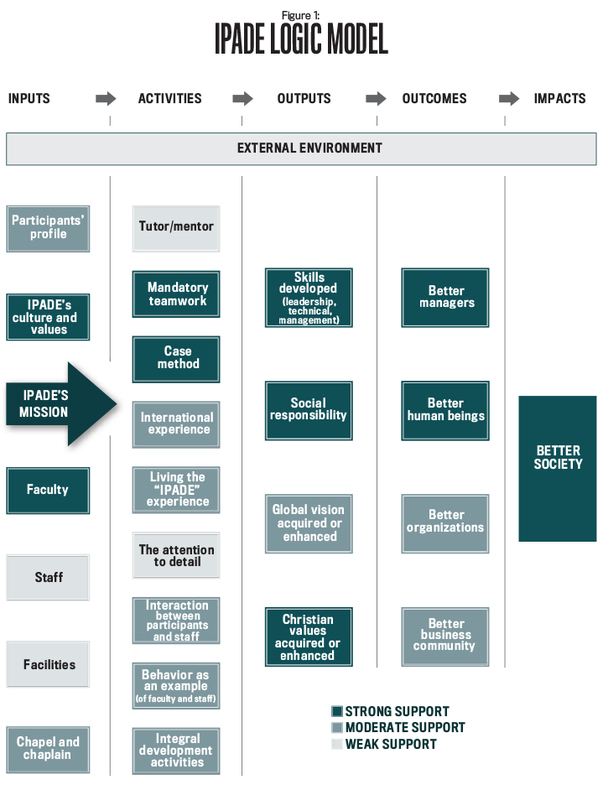 As you can see, the interviews provide significant support for some elements of the IPADE logic model and less support for others, which provides an opportunity for IPADE to improve and do more on those elements to create even greater impact. Given this new empirical evidence, there also is an opportunity for IPADE to examine whether changes need to be made to its mission, the hypothesized logic model, or the implementation through inputs and activities. Examination of the results in Figure 1, the underlying data, and the various causal paths that lead to social impact was informative and, in some cases, quite surprising. Based on the archival data, the research team expected these results to show strong support for an impact of producing better managers. Epstein didn’t expect to find such clear evidence of the strong social impact the IPADE programs had in producing better human beings and a better society in addition to better managers. The consistent comments about the role of the human factor—including ethics and values—in business, in personal success, and in social impact was surprising. There was very strong support for the conclusion that IPADE has created significant social impact by developing better managers and better human beings. This is at the heart of the social impact that’s central to IPADE’s mission and represents primary leading indicators of contributing to a better society. This support from the non-IPADE business leaders and human resource and recruiting executives was particularly strong. The empirical results reveal that the strongest factors that lead to impact are the skills developed (including leadership, technical, and management), social responsibility, and Christian values. The strongest results of the nine activities articulated in the logic model are the case method and the mandatory teamwork. And the most important inputs from the graduates’ perspective were the faculty, the IPADE mission, and IPADE’s culture and values. But the story is far richer than that. An analysis of the empirical evidence reveals clear support for a logic model that’s focused on achieving business success with the human factor and values as central to that success. The logic model articulates, and the empirical evidence strongly supports, that IPADE’s mission and activities are well aligned to deliver a differentiated and more socially impactful experience in degree and nondegree executive programs alike. After IPADE received the report, it asked Epstein to present the detailed results of the study to the entire faculty and leadership of the school to review the implications and determine the changes to be made. IPADE is taking the results seriously and is looking carefully at ways to improve its social impact in the future. This includes evaluating the current logic model and determining whether the hypothesized cause-and-effect relationships are still correct. If the logic model is still correct, then the next area to consider is whether some activities should be redesigned or new activities should be developed to have greater social impact and improve achievement of IPADE’s objectives. The school is also looking into developing a program for the collection of more and better data to measure and monitor social impact more comprehensively and on a regular basis for continuous improvement (see “Recommendations for IPADE”). In addition, IPADE’s dean is leading a strategic project on the future of IPADE in 2030, and the results of this social impact project are an important input to that project. The two-step process in IPADE’s project can serve as a model for organizations of all types that want to measure social impact. It’s critical to clearly and rigorously define a mission and what success would look like and then empirically test whether the desired impact is achieved. Nonprofit organizations, governments, foundations, and charities, and other social-purpose organizations—including universities and business schools—should be evaluating their social impact. There’s an obligation to determine whether the desired social impact is being achieved, whether the organization is making a difference, and how the contribution to society can be improved. The logic model is a critical component of this work. Measuring inputs, activities, and outputs isn’t enough. For-profit businesses and organizations would also benefit from this type of effort. While they typically measure success based on profit, increased share price, or some other financial measure, the measures of performance in these situations are more likely to be related to achievement of social objectives like educating children, curing diseases, reducing pollution, and more. 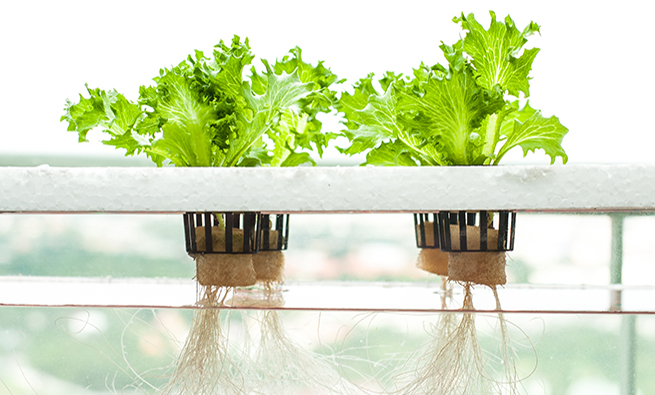 This is important for businesses for evaluating the impact of not only their social responsibility and sustainability efforts but to evaluate the overall impact of their products, services, and other activities. 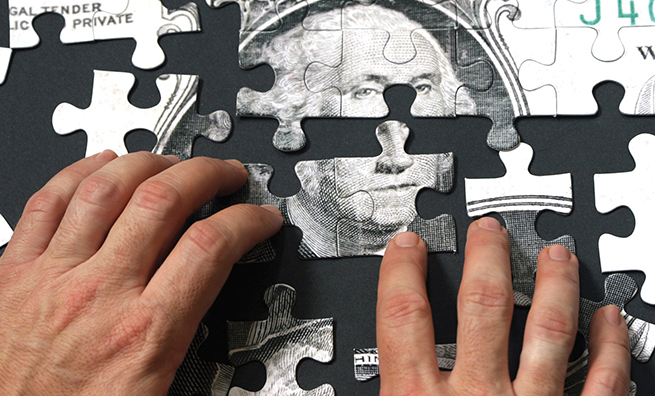 Finance and accounting professionals can play a key role in these efforts. They have the skills and competencies to create a model like IPADE and to perform these evaluations properly. The field is growing rapidly, and too often these evaluations are performed by those with little expertise in performance evaluation. 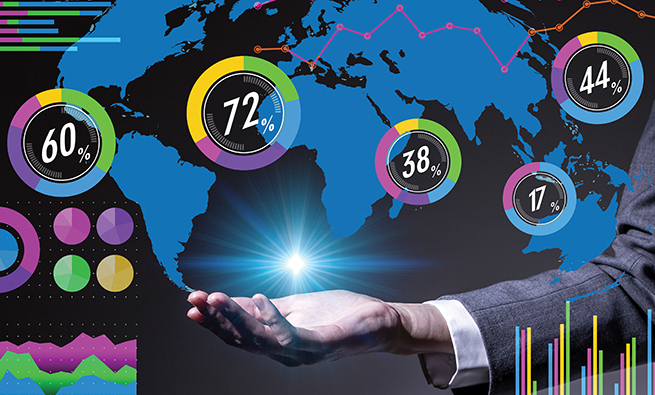 By applying their expertise in performance measurement and management to social purposes, finance and accounting professionals can use their skills and competencies to make an important contribution to both their organizations and to society. Marc J. Epstein, Ph.D., was, until recently, a full-time business professor (Rice, Harvard, Stanford, INSEAD) and is the author of more than 20 books and 200 articles as well as a speaker and advisor to leading organizations globally. An IMA member, he is one of the global leaders in measuring and managing the social impact of companies, NGOs, and foundations. He can be reached at epstein@rice.edu. Rafael Gómez-Nava, Ph.D., is the dean of IPADE Business School. He previously served as senior associate dean of the full-time MBA at IPADE. He also is a professor in the Operations Management department. He can be contacted at rgomez@ipade.mx. Antonio Casanueva, Ph.D., is professor of Managerial Control and Information and the associate dean of the IPADE Business School campus in Guadalajara. He can be reached at a.casanueva@ipade.mx. Great article and research study. your work ties in well with my work at the u.k. based maturity institute as my leadership book and the rp5 strategy model that gives equal weight to what we do (mission / task) and how we do it (behaviour / values). maybe we should connect?